Kochi, February4 : The Reliance Foundation Jr. NBA program which has received immense response in Kochi saw the spirited participation of more than 500 schools and 3 lakh children. St Ephrem’s HSS, Mannam , won the title in U14 division beating Silver Hill HSS, Kozhikode by 38-25 while Mount Carmel HSS beats St Gorettis HSS, Trivandrum 41-19 in the 5 on 5 City Championship. These teams entered the finals after competing with more than 180 schools from four zones that includes Kozhikode ,Kochi, Trivandrum and Kottayam. 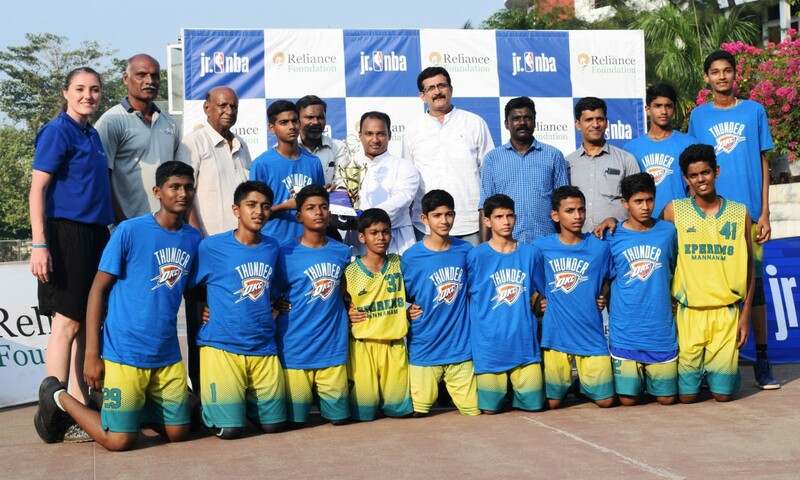 The Trophies and Certificates were distributed by P J Sunny( President, Kerala Basketball Association) , Jaison Peter (President, Ernakulum District Basketball Association) and Adv. Salim KA (Vice President, Kerala Basketball Association).